Leaning on the sounds of the past, Wolfmother makes a record that is very much in the now. Wolfmother returns with a record that owes as much to 1976 and it does 2016, as much to glam as it does to heavy metal and as much to Andrew Stockdale’s keen songwriting as it does to Brendan O’ Brien’s smart production. This is the kind of kick in the teeth this Australian unit gave us a decade back and it’s high time we had that same kick again. And kick this little sucker does. The record opens with the Sabbath-y “Love That You Give”, a track that lasts just over the 2:30 mark but covers plenty of musical and lyrical ground with its droning, throbbing rhythms and soaring melody lines. If one didn’t know any better they might be free to think that these sounds crawled from beneath a garage somewhere in the Baltimore suburbs or in one of those towns in Pennsylvania with pockets of gas underneath them that cause random and frightening explosions as though hell itself were opening up. From there we move to the title track and it retains its heaviness while proving hookier, poppier at the same time, asking us to imagining a less lucid, more stoned and much cooler version of Billy Squier raising his ax high and parting the seven seas. The group gives us a stomping Sweet, Queen and T. Rex-influenced number via “Baroness”, a track that succeeds despite the over-used refrain of “tonight/tonight”. It takes us deeper into Stockdale’s mental vault, revealing that his tricks run deeper than we might think. Those tricks even run to the variety of the rock ballad. That arrives here with “Pretty Peggy”. The little love song doesn’t quite sound like the rest of those numbers. It’s clean, acoustic and cut from a cloth that places it somewhere in Wales circa 1999 rather than London in 1974. This is a credit, of course, to songwriter, band and engineer who give us something so uncharacteristic that it makes perfect sense. From there, the record gets back to rockin’ with the dirty, dirty “City Lights”, which swirls and surrounds so quickly you begin to think you’re at a roller rink, waiting to pass up the kids moving in the slow lane. “Simple Life”, meanwhile, could have been cribbed from some back porch bumpkins deep in the heart of the American Midwest. That, in the meantime sets the dirty template for the rest of the record as it winds its way to a close almost without incident. Whereas “Pretty Peggy” was out of character for the rest of the record and works, a second stab at stepping out from the normal sturm und drang, an otherwise pleasant pop number titled “Best of a Bad Situation” doesn’t have the same panache and could have easily been supplanted by either of the record’s two bonus tracks, the space truckin’ “Remove Your Mask” or the expertly crafted “Wedding”. 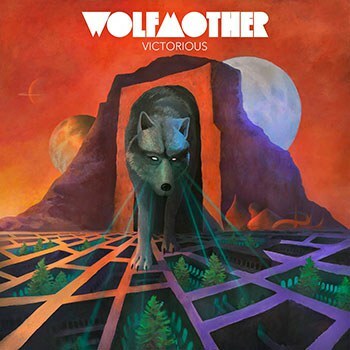 If some were concerned that Wolfmother was never gonna be able to top its earliest work, you should be able to rest easy from this point forward. A welcome and appropriate return from one of the best bands to emerge in the last decade.